NAIROBI, Oct 30 2017 (IPS) - Fostering and harnessing innovative technologies could significantly reduce the negative impacts from climate change, including drought, water scarcity and food insecurity in African countries. According to the United Nations Convention to Combat Desertification (UNCCD) by 2025, 1.8 billion people will experience absolute water scarcity, and two-thirds of the world will be living under water-stressed conditions. By 2050, the demand for water is expected to increase by 50 percent. Drought-prone regions also run the risk of becoming a breeding ground for insurgencies, extremism, and terrorism across borders. Likewise, drought caused as a result of climate change, a complex global phenomenon with significant and pervasive socio-economic and environmental impacts, is causing more deaths and displacing more people than any other natural disaster. UNCCD told IPS that extreme and erratic weather events such as droughts, flash floods, hurricanes, and typhoons increase food insecurity. For instance, droughts create food shortages. Flashfloods erode fertile soil. These phenomena degrade the land, reducing its capacity to absorb and store water, in turn, its productivity. Therefore, the continent needs a paradigm shift that would lead to the effective mitigation and resilience to the effects of climate change. For example, implementing early warning systems and new technologies by metrological agencies, use of cell phones to share climate information with local communities, the creation of climate maps and deployment of drones to collect climate data. 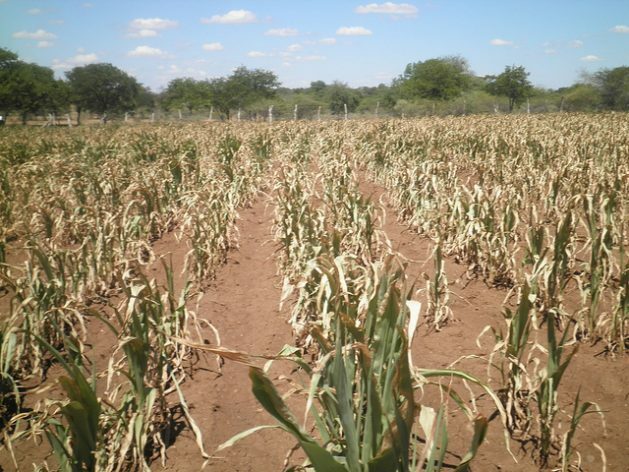 “Comprehensive early warning systems would help countries to analyze drought risk, to monitor and predict the location and intensity of an upcoming drought, to alert and communicate in time to the authorities, media and vulnerable communities and to inform affected populations what options or courses of action they can take to pre-empt or reduce the potential impact of an oncoming drought,” said UNCCD. According to UNCCD, adopting smart tech strategies would help Africa to address the drought challenges in many ways, depending on the action strategy and the technology and its application. For herders and pastoralists in the African drylands, for example, smart techs/mobile applications would help increase the security of pastoral zones by guiding them to the nearest water resources so as to ensure year-round access to grazing and water. Moreover, it would support them to create networks as they arrive in unfamiliar communities, helping them gather relevant information related to their livestock as well as access to emergency management and weather. According to the Confronting Drought in Africa’s Drylands: Opportunities for Enhancing Resilience report, while drought is a global phenomenon, the impacts are more severe in developing countries where coping capacities are limited. In sub-Saharan Africa, drought causes significant food insecurity and famine. It has crippled countries from Ethiopia to Zimbabwe and affected as many as 36 million people in the region. Drought in sub-Saharan Africa is also associated with social unrest, local conflict, and forced migration. Drought-prone regions run the risk of becoming a breeding ground for insurgencies, extremism, and terrorism across borders. Nicholas Sitko, Programme Coordinator, Agricultural Development Economics Divisions at the Food and Agriculture Organization of the United Nations and an expert in rural development with extensive experience in Africa, told IPS that much needs to be done in Africa, where large shares of the population rely directly on agriculture production or indirectly on agriculture. When farmers have knowledge of impending climate events, they can select more appropriate seed types or crop varieties, or can shift their investments and labor to other activities that are less prone to the climate shock. “This is really critical for building resilience to climate change. The use of new forecasting models coupled with ICT that can link this information to policymakers and farmers provides new opportunities for adaptation than existed just a few years ago. Yet, they still remain fairly limited in scope and need to be scaled out to more users,” said Sitko. He noted that there is already a range of on-the-shelf farm practices that can help farmers improve and stabilize yields in the context of climate change, but what is appropriate for a farmer varies considerably by climate region and their economic conditions. FAO is working with the World Meteorological Organization to better respond to climate variability and climate change on the basis of better and more readily accessible data. Speaking at a G7 Agriculture Ministers meeting on Oct. 14, FAO Director-General José Graziano da Silva noted that some 75 countries mainly in Africa, and many Small Island Developing States (SIDS), do not have the capacity to translate the weather data, including longer-term forecasts, data into information for farmers. “There is an urgent need to take the data which is available globally and to translate it to the ground level,” he said. Florence Atieno, a smallholder farmer from Western Kenya, would welcome technology that enabled farmers to obtain accurate scientific information on when to plant, to assess the mineral deficiencies in the soil to purchase the right fertilizers, to access knowledge about improved farming techniques and to negotiate better prices for their crop. She told IPS not all people, systems, regions and sectors are equally vulnerable to drought, stressing that it was important to combine forecasts with detailed knowledge of how landscapes and societies respond to the lack of rain. That knowledge is then turned into an early intervention. “Africa needs to understand who is vulnerable and why, as well as the processes that contribute to vulnerability in order to assess the risk profiles of vulnerable regions and population groups,” said Atieno. The causal effect that ails Africa’s continual dalliance with drought is perhaps more cultural than climatic. For weather forecasts are pan-global and heard by all. We hear of pending short rains or excessive rains yet fail to plan ahead. If tomorrow we were to start on constructions towards water retention and storage for use in dry seasons, just like we squirrel savings for ‘a rainy day’ that oft never comes, then drought would not necessarily crop-wiping out as we endure continually. What of overstocking livestock fully aware that there will be drought and no pasture yet our cultural beliefs fail to ‘inform’ us on the wisdom of selling off the excessive herds? What of planting crops like maize for ever just because our culture has to eat ugali/posho instead of adopting to crops that would survive harsh weather as well as conserve the environment? What of the culture of owing palm-size allotments by successive land subdivisions whereas incorporations of such unproductive plots even if by aquisition by foreign governments would increase productivity and generate revenue?